lt;stronggt;SPG19128lt;/stronggt;lt;BR/gt;Simple Green All-Purpose Industrial Cleaner/Degreaserlt;BR/gt;Strong yet safe cleaner removes oil, lubricants and grime from washable surfaces. Rinses easily. Concentrated dilutes with water. For pressure washing and steam cleaning, maintenance. Safe for food-preparation areas. Exempt from OSHA and EPA special handling and personal protection requirements for hazardous materials. Nonabrasive and nonflammable. Application: Machinery Tools Applicable Material: Metal.lt;BR/gt;lt;BR/gt;lt;stronggt;RCP2005CHAlt;/stronggt;lt;BR/gt;Simple Green All-Purpose Industrial Cleaner/Degreaserlt;BR/gt;Handy dustpan features a tapered front edge to help simplify sweeping-up. Heavy-duty, moderately flexible plastic provides commercial-grade durability. Lanyard handle-hole allows you to hang and store the pan out of the way. Material(s): Polypropylene; Width: 8 1/4quot;. ~ Includes one dustpan. 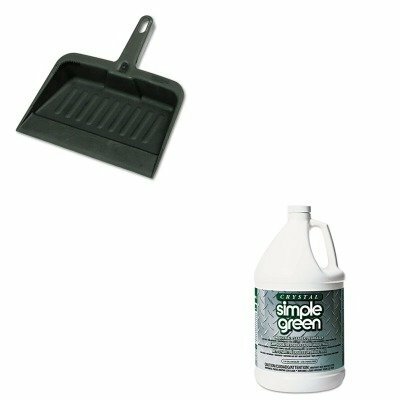 If you have any questions about this product by Simple Green, contact us by completing and submitting the form below. If you are looking for a specif part number, please include it with your message.